Trim end square with scissors. Put reel in tank and cover. 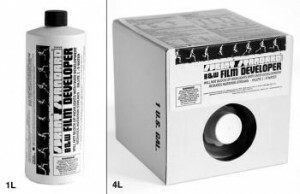 Developer: Mix fresh for your roll Sprint mix 1 part concentrate with 9 parts water. Developer time is very important - stop and fix can safely go longer than recommended time . 5) Cap small opening, Rap tank to dislodge bubbles, agitate gently for 30 sec. Fix: Tri-X & HP5 for 5 minutes Delta 400, T-Max and Arista EDU for at least 10 minutes. Check for proper fixing. If there is a purple color, re-fix for more minutes. 13) soak in Photo-flo (wetting agent) for 30 sec. 3 drops in tank of water. 17) Store film in plastic film sleeves. Identify your film with your name, and date and roll number. Log film in written record. Treat your film very carefully. Keep it clean.